TOMORROW, WEDNESDAY, LIVE IN VENTURA, CA! Hope to see you! Luis. IF YOU MISSED IT YOU CAN LISTEN HERE! THIS SUMMER, LIVE AT THE JAZZ BAKERY IN LA! This summer, on Friday, August 22 and Saturday, August 23, we will be performing at the Jazz Bakery in Los Angeles, the premier Jazz venue in Southern California ( 3233 HELMS AVE, Los Angeles, CA 90034. Phone:310-271-9039). There will be two shows nightly: 8 PM & 9:30 PM. Tickets: $25 ($13 for students 21 and under). Please, check in later on for more info on those two nights, and on other upcoming performances. Cheers! Luis. 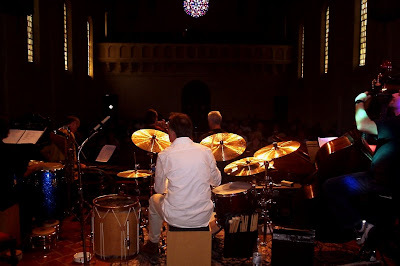 Kevin Winard: Percussion (Kevin will be home a few days from his road gig with Steve Tyrrell, and will be joining us).